Voted BEST PRICE on the web! 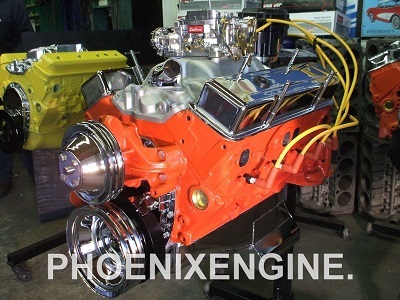 Best value and product for a street engine! 2. 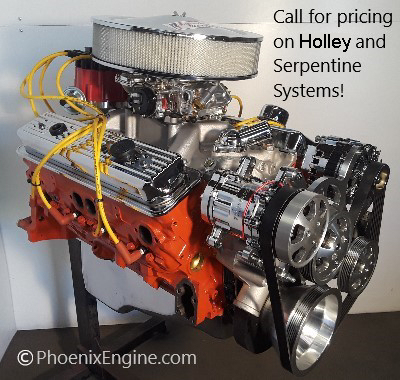 Ask for '96 to 2002 second generation Vortec heads (heart shaped chamber) upgrade for low, great mid range, and high end torque - an additional upgrade for $495. The second generation Vortec heads also accommodate serpentine drive belt assemblies! PLEASE CALL FOR MORE INFO ON PROMOTIONAL PRICING AND SALES! VIDEO: Click HERE to see our FAST TRACK startup in action on this engine! VIDEO: This is with open headers, after the engine has been super tuned on our FAST TRACK! CLICK HERE to see a real-time Dyno run video! This is the best turnkey you'll find! 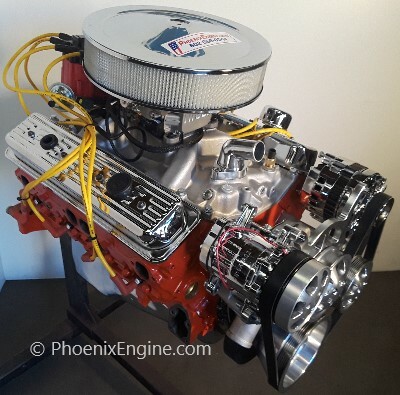 It's an excellent street machine engine with a great Old School sound. 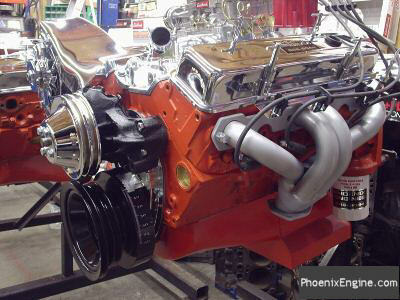 This Power 2 Engine Combination would be GREAT in your MUSCLECAR, Street, Hot Rod, Custom Truck, Kit Car, 4 X 4, or JEEP. Your engine can also be Dyno tested, for an additional charge. 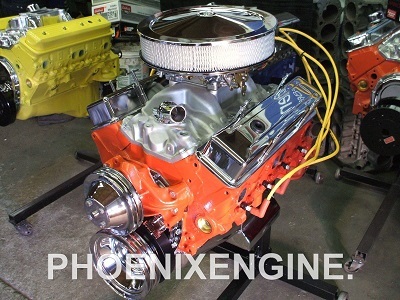 These engines are Seasoned Heavy Duty Chevy Small Blocks. Engine will run on unleaded fuel. 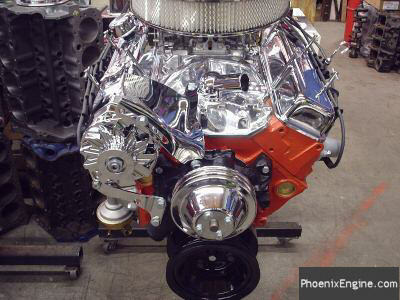 THIS ENGINE IS A GREAT DAILY DRIVER - WILL RUN ON PUMP GAS! If you request a different cam, you will need to speak with one of our expert counter men. 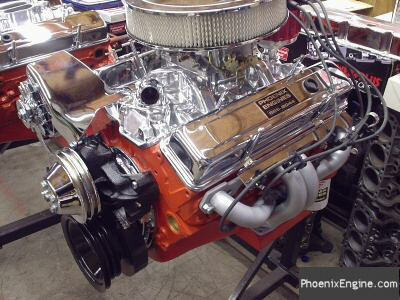 Edelbrock Carb 750 CFM with electric choke. You can also choose a Holly 750 carburetor CFM with electric choke. 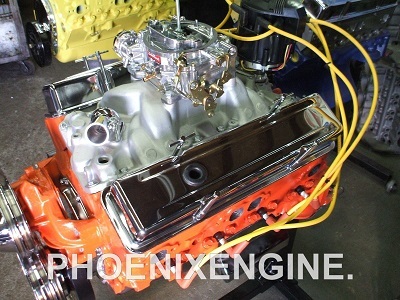 Aluminum intake is included for the nostalgic look. Optional Polished intake is extra. 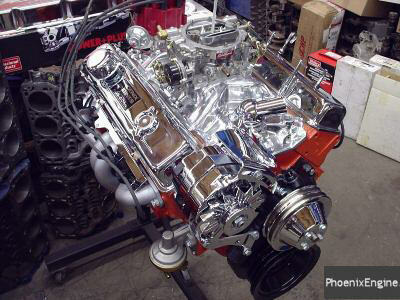 Call on Edelbrock Old School Torker intake manifold upgrades! MSD 2 pack or MSD 6AL 3 pack is extra. P.E.R. 8" harmonic balancer, timing flag, flex plate. Chrome valve covers, two chrome pulleys. Chrome 14" air cleaner included. 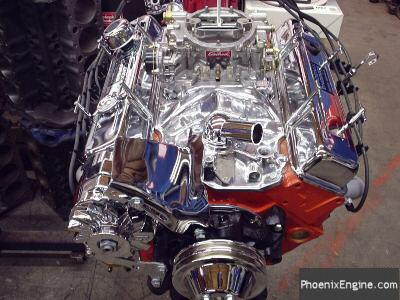 Power Plus High Rise dual plane intake manifold (or Edelbrock aluminum, or plain no-name aluminum intake for the nostalgic look. Please note that the polished intake is extra. 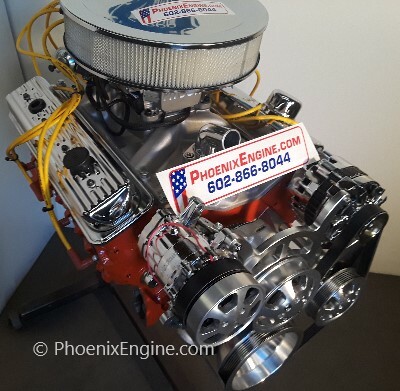 Built from one of our Dyno tested and road proven Dyno packages Your engine can also be Dyno tested for an additional charge. 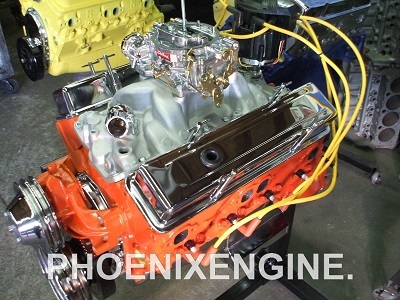 YOU CAN ORDER THIS ENGINE WITH AN OPTIONAL 5 QT CHROME OIL PAN OR A 7 QT OIL PAN FOR AN EXTRA CHARGE. 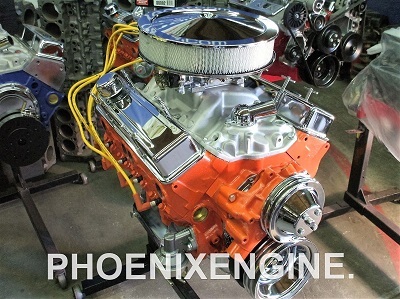 FOR ANY CHANGES NEEDED, JUST CALL AND WE WILL BUILD A CUSTOM ENGINE PACKAGE FOR YOU FROM 375 HORSEPOWER TO 714 HORSEPOWER. — — YOU CAN ALSO CHANGE THE COLOR, CHOOSING FROM OVER 25 DIFFERENT COLORS. 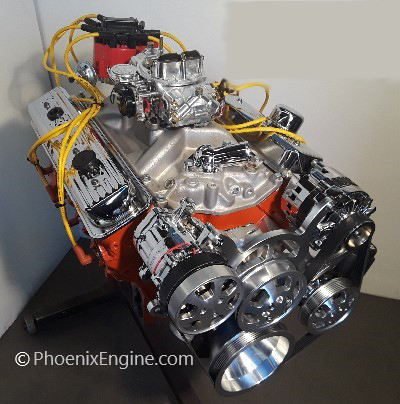 This Power 2® Engine is Totally REBUILT in our Machine Shop by Professionals from start to finish. 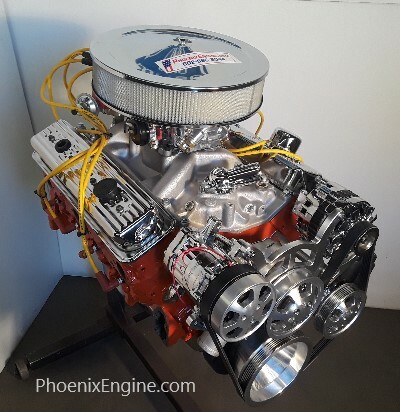 The Power 2® Engine Performance Combination was developed from our over 45 years of experience on MUSCLECARS, STREET STRIPS, CUSTOM TRUCKS, 4x4s, and JEEPS. 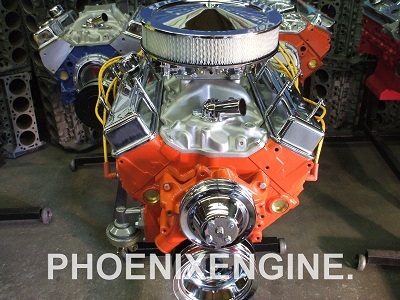 PhoenixEngine.com has built over 140,000 quality engines to date. SPECIAL PROMO!! Call NOW for FREE SHIPPING to Southern California! We also offer super shipping rates to all 48 continental states. Ask about shipping to Alaska, Hawaii, or international destinations. 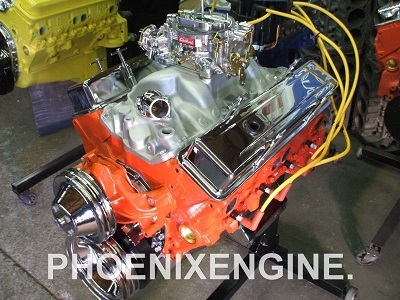 Some of the photos below show this engine with FiTech and Serpentine systems. Both FiTech and Serpentine systems are on SALE now! Call us for the best pricing on these upgrades! 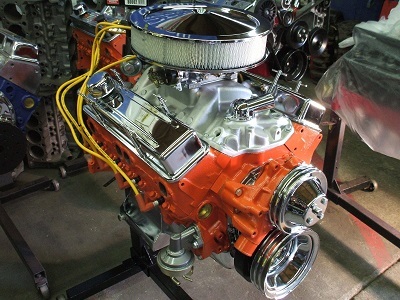 Chevy 350 - 355HP Turnkey Crate Engine. Scroll down for more photos. 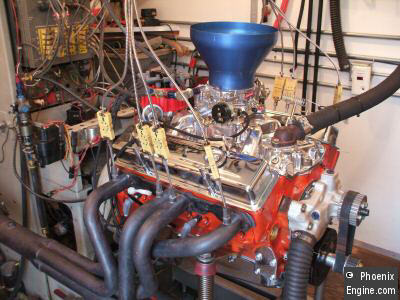 Dyno testing the Chevy 350 - 355HP engine. Click the photo to see a video clip of the dyno run. 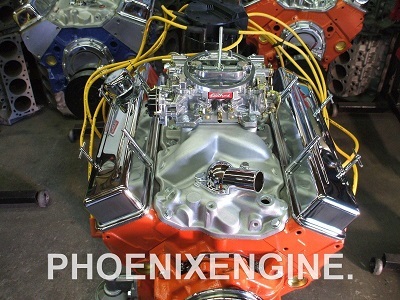 Some of the photos above show this engine with FiTech and Serpentine systems. Both FiTech and Serpentine systems are on SALE now! 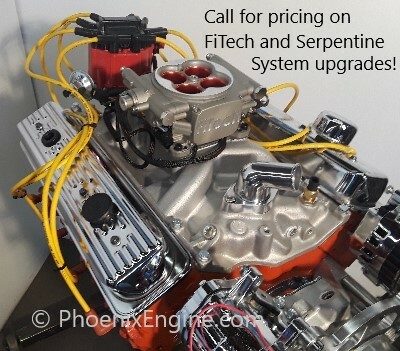 Call us for the best pricing on these upgrades!